# 21 - # 30 - SIGN. COLD SAND. # 31 - # 36 - SIGN. - HOT SAND. Artisan Rock "N" Roll Bun, 1/3 Pound Hamburger. Please choose from the following toppings: Yellow Mustard, Ketchup, 1000 Island, Mayonnaise, Lettuce, Tomatoes, Red Onions & Pickles. A Small Nacho's & Cheese Sauce. Jalapeno's If You Want Them. Includes 6 oz Fountain Drink Of Your Choice. NEW ENGLAND CLAM CHOWDER IN A SOURDOUGH BREAD BOWL. CATERING MENU ROCK "N" ROLL DELI CATERING IS PROUD TO FEATURE BOAR'S HEAD MEATS & CHEESES. BOARS HEAD MEATS & CHEESES ARE GLUTEN FREE, CONTAIN NO ARTIFICIAL COLORS OR FLAVORS, NO MSG, NO FILLERS, NO BY PRODUCTS & NO TRANS FAT. JUST PURE BEEF PORK POULTRY & SPICES! 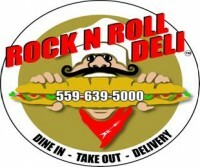 ROCK "N" ROLL DELI CATERING IS PERFECT FOR BUSINESS, EVENTS, GRADUATIONS, MEETINGS, WEDDINGS, PARTIES, NEIGHBORHOOD GET - TOGETHER'S AND SO MUCH MORE! Please Allow One (1) Day Advance Notice On All Platter Orders. During The Holiday Season Please Allow Three (3) Day Advance Notice. DELIVERY $5.00 ( Hanford & Surrounding Areas) MINIMUM $50.00 Order. ORDERS OVER $200.00 - FREE DELIVERY! A FLAVORFUL SANDWICH MADE ON DELICIOUS FOCACCIA BREAD. EACH TRIANGLE SANDWICH INCLUDES A VARIETY OF TURKEY BREAST, BLACK FORREST HAM, ROAST BEEF & PROVOLONE CHEESE MARINATED ROASTED EGGPLANT, LETTUCE, & TOMATOES. VEGETARIAN STYLE ALSO AVAILABLE. ROCK "N" ROLL DELI - 2" FOOT SUPER SUB. PILED HIGH WITH TURKEY BREAST, BLACK FORREST HAM, DRY SALAMI, MORTADELLA, JACK & CHEDDAR CHEESE, LETTUCE, TOMATO, PEPPERS, PICKLES, MAYO & MUSTARD & CHOICE OF BREAD. ROCK "N" ROLL DELI - 4"FOOT SUPER SUB. PILED HIGH WITH TURKEY BREAST, BLACK FORREST HAM, DRY SALAMI, MORTADELLA, JACK & CHEDDAR CHEESE, LETTUCE, TOMATO, PEPPERS, PICKLES, MAYO & MUSTARD & CHOICE OF BREAD. ROCK "N" ROLL DELI - 6' FOOT SUPER SUB. PILED HIGH WITH TURKEY BREAST, BLACK FORREST HAM, DRY SALAMI, MORTADELLA, JACK & CHEDDAR CHEESE, LETTUCE, TOMATO, PEPPERS, PICKLES, MAYO & MUSTARD & CHOICE OF BREAD. TRADITIONAL RAINBOW ROTINI PASTA LOADED WITH BLACK OLIVES, SWEET YELLOW SQUASH, GREEN ZUCCHINI, ARTICHOKE HEARTS, RED BELL PEPPERS, CARROTS, BROCCOLI, & SPECIAL SPICES IN A VINAIGRETTE DRESSING. TENDER HAND LEAFED ROMAINE LETTUCE LOADED WITH CUCUMBERS, PURPLE ONIONS, TOMATOES, RED BELL PEPPERS AND A DRESSING OF YOUR CHOICE. AN APPETIZING SELECTION OF IN SEASON FRUITS INCLUDING GRAPES, STRAWBERRIES, CANTALOUPE, WATERMELON, & HONEY DEW. FRUIT VARIETY MAY VARY DUE TO SEASON.